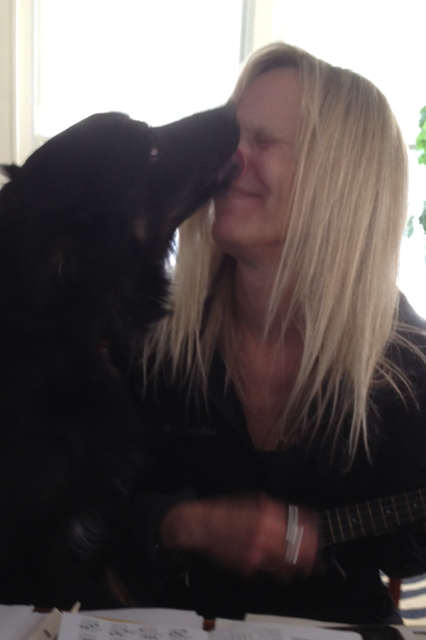 Tripper Dog-Dog-Dog does not like the ukulele. He is not shy about expressing his opinions, particularly where his musical tastes are concerned. For instance, Kerri has a djembe (a very cool drum) that he adores. My frame drum, on the other hand, makes him frantic and filled with angst. I was certain that it was my playing and not the drum that drove him nuts until Kerri tried my drum and he was equally distressed. So desperate was he to silence the offending sound that he tried to put his head through the drum. He bit the frame. We can no longer play my frame drum in the house as it evokes the inner rabid wolf spirit in the normally calm and reserved Tripper Dog. Our house is filled with musical instruments. Dog-Dog hangs out under the piano when Kerri plays. He wraps himself around her stool and chews a bone when she practices her cello. He sleeps through my clumsy first attempts at new guitar chords (or, perhaps my playing puts him to sleep). His broadmindedness snaps shut at the ukulele. He will go to great lengths to stop the strumming. If we contain him in the kitchen he howls. I’m considering an experiment. If you’ve not yet discovered Jake Shimabukuro, do yourself a favor and listen to his work. He is a ukulele master and makes those four little strings sound like a full orchestra. He plays rock and jazz and the blues and anything else that you can’t imagine coming out of a ukulele. Go see his concerts. You won’t believe your eyes or your ears. I have a Jake Shimabukuro CD and am considering slipping it on the player while Tripper isn’t looking. I’m wondering if his disapproval of the ukulele might dissolve in the face of mastery. I’m wondering if Tripper Dog-Dog might gain an appreciation of the ukulele if introduced to deeper levels of sophistication. He is, after all, a puppy and generally open to learning new tricks. As an old dog, I, too, am open to learning new tricks and the ongoing lesson in this life is about what I can and cannot control. 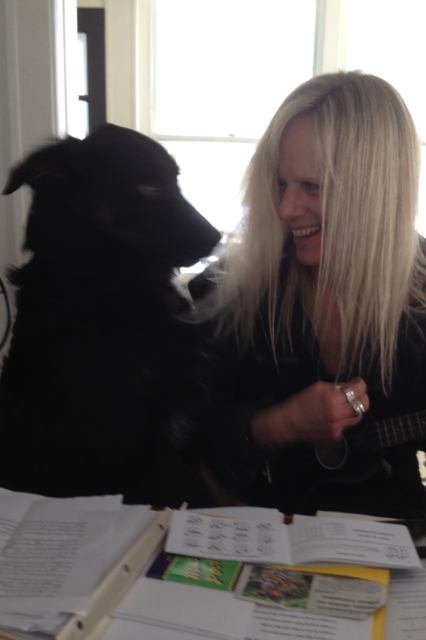 Whether or not Dog-Dog ever grows to appreciate the ukulele is definitely out of my control. What is in my control is this: I will love him either way.